The 27-inch full HD device comes with an AI butler that serves as a personal assistant. Duo is offering a developer kit and will have its very own App Store. A while back, Mark Zuckerberg showed off Jarvis, an AI personal assistant he had built to help around the home–his home. Unfortunately, the technology has yet to go into production. For those of us hoping for something similar, there’s Duo, an AI-powered computer with a mirror-based interface that’s meant to serve as mission control for your soon-to-be smart home. It won’t shoot your clothes at you or speak in Mandarin like Jarvis (yet), but Duo has its very own bag o’ tricks. Duo looks like a mirror, but its creators insist it’s not a smart mirror; they’d much rather call it a computer that happens to have a reflective screen. The reason it does have a reflective screen is that the device is a pretty substantial 27 inches in height. Getting such a large piece of additional equipment to blend in with the interiors in a room would be a tall order unless you just made it reflective, so it takes on the features of whatever it is around. It helps that reflective screens look pretty cool and have that futuristic vibe to them. To cover the rest of the hardware details, Duo has a full HD display that supports 5-point touch. It is just 1.9 mm in thickness and weighs eight pounds. As you can see in the promo video below, the build and UI are in line with what you’d expect from a device that hopes to become the interface between you and your home. Now to get to what Duo actually does. Everything the device can perform is delivered through an artificially intelligent personal assistant called Albert. If you don’t like Albert’s accent or name or gender or sassiness, you can tweak it–all of that stuff is customizable. What you will probably like, is that Albert can understand what you’re saying in conversation, much like Alexa or Siri. He can then execute on commands you give, such as playing a specific Spotify playlist, browsing the Web based on oral searches, streaming video, reading the news, and a lot more. The more home-specific features include the ability control lights or set the temperature in the room just by talking to Albert. The feature list isn’t limited to that, since the makers offer developers access to the HomeOS SDK. The apps that are made by developers will be available on Duo’s very own App Store. Duo is accepting pre-orders for units of its AI-powered mirror computer home controller device thing, priced at $399 for the first 1000 people who book it. Crossing that number, the price will be upped to $500. The first batch is expected to start shipping October 2017, but the makers admit on the website that they could encounter shipping delays. Just the fact that the device is coming with its own App Store AND developer kit is going to be huge. At least, if there is an app you are looking for, the right person with the right skills can just make it for you! I really like this idea. There was always a little part of me that wanted to have a small TV like the screen in the bathroom for catching up with things in the morning. Being able to connect a device like this to news or weather reports is pretty sweet. So much can be connected today, a product like this can really stand out on the features. Getting in line early for this AI powered mirror is a great saving, but honestly, if I was unable to get the discount, I would still spend $500 for something like this. 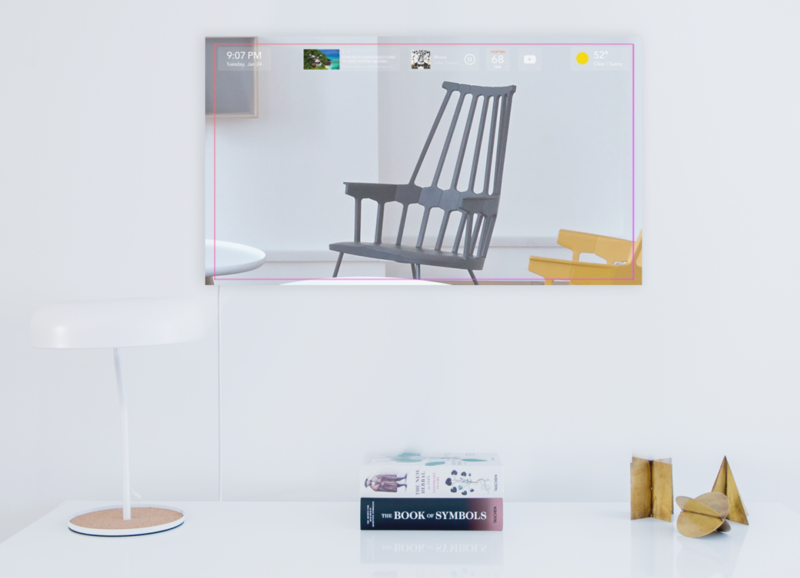 The mirror is almost like having a large television, laptop or smartphone all in one. For those that are on the GO all the time and need a little bit of information they cannot get from the smartphone, this product is perfect. We have all seen these in the movies! For a place where you are getting ready for work, or even as two-way mirror in a convenience store, I can see a use for these. Not a bad price either considering what you are actually getting with the mirror. AI can easily be the downfall of many things as well!